Yesterday, EW broke the news that Benicio Del Toro’s Last Jedi character is a “slicer” that Finn (John Boyega) and Rose (Kelly Marie Tran) are tracking down. Despite the fact that you may never have heard the word slicer in a Star Wars movie, they have a long and important history in that universe. First of all, it’s remarkable that the term slicer—a shortening of code-slicer—survived to be used in the new canon at all. It’s the Star Wars equivalent of a hacker and it first popped up in Heir to the Empire. (Although, to be fair, so much of the Star Wars universe had its first appearance in that book.) And Heir to the Empire, despite being the book that kicked off the EU and rejuvenated Star Wars for a lot of people, is technically no longer canon. Moreover, there’s been a concerted effort to clear out parallelisms like this from the Star Wars vernacular. Save for slicer droids, most slicers we’ve come across before have either been the anti-Empire crusading kinds or the ones working on the black market for basically anyone who could pay them. The former kind of slicer shows up in the books as either the Star Wars equivalent of a white hat hacker or people who join the Rebellion/New Republic out of a distaste for the Empire. Grinder (a nickname; he was actually a Bothan named Eurrsk Thri’ag because, again, Bothans = slicers) appeared in Aaron Allston’s Wraith Squadron as a very good, very arrogant, and very mischievous slicer who happened to work for the New Republic. Another Wraith named Castin Donn was the slicer responsible for showing Coruscant the explosion of the second Death Star before Imperial propaganda could clean it up, leading to the toppling of the Emperor statue that was included in the Special Edition of Return of the Jedi. Sabine Wren in the TV show Rebels has some slicing skills. The money-based, morally-grey slicers pop up most often in the Star Wars video games—which makes sense, since they are good sources of information and will provide it regardless of which side you’ve chosen to be on. (Seriously, though, the slicer page on Wookieepedia is full of video game characters.) Largely, what they have in common is a willingness to hand over information or technology to whomever can buy it. It’s the Star Wars following the general fiction idea of hackers as rogues, rather than simply the name for someone with a particular skill set that could be any type of person. All slicers, of all kinds, tend towards arrogance. There’s every chance DJ is one of many in the galaxy who describe themselves as the best. That seems in line with what we know about DJ so far. John Boyega described the slicer’s role in the story as “We just need a codebreaker and he’s the best in the galaxy. Unfortunately, he’s very dodgy and only in it for financial gain. 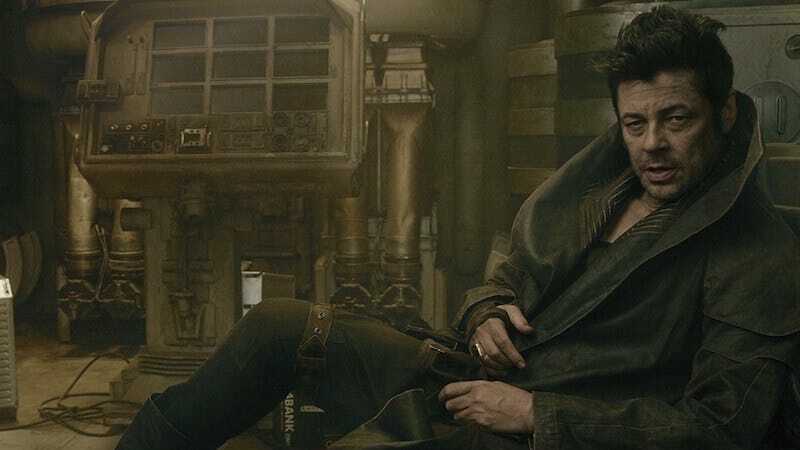 He doesn’t fight for any side.” The fact that he’s morally grey, that characters from the Resistance go to him for help, and that they find him on a luxury world (in this case, a casino on Canto Bight) has drawn comparisons to Lando Calrissian in The Empire Strikes Back. And, yeah, a lot of how he’s been talked about does seem more in line with how smugglers and former smugglers are described than slicers. Boyega further said DJ “has distinct opinions. The Resistance bombs the First Order one day, the First Order bombs the Resistance on another. It’s an ongoing war that will never end. For him, he’s trying to benefit off of that—which doesn’t make him the person you want to trust.” That all sounds, actually, a bit more like how Talon Karrde was presented back in Heir to the Empire, which also introduced slicers. Karrde was introduced as the biggest smuggler in the business, who put a premium on gathering information and was willing, at least early on, to sell to any side. Karrde also had in his employ the very first slicer we ever met in any detail: Zakarisz Ghent. First of all, that is a classically ridiculous Star Wars name. Second, Ghent fits neither of the broader groups. He works for Karrde for whomever pays, yes, but he mostly just likes code. He’s oblivious to everything else around him, to the point where him even noticing that the Empire is doing anything is a sign that things have gotten pretty bad. He shows up again, much later in the EU, looking to use his skills for more than a challenge or because his boss asked. Instead, it’s because he wants to right a wrong. A wrong that he’s only heard about, too, and not one he was involved in causing. It’s actually a more interesting arc than the classic “smuggler with a heart of gold” ones that seem to plague Star Wars. I almost wish DJ was more Ghent-like than Karrde or Lando-like. It would bring a new energy to the story. That said, DJ is joining a long line of arrogant, brilliant, slightly weird slicers that have long populated Star Wars. From Kiph to Ghent to to Castin to Grinder and so on, DJ has quite a lineage to live up to.